Even though I’m supposed to be retired from writing, I thought I’d jump in a bit this December with some Knight Models and Reaper Christmas miniature reviews. The video game side of things is pretty much at a standstill this time of year and so what better way to pad content than with photos and reviews of some great miniatures you can pick up and paint yourself. Today we’re going to look at the new Kevin Conroy voiced Batman: The Animated Series figure from Knight Models that comes out in a few days. 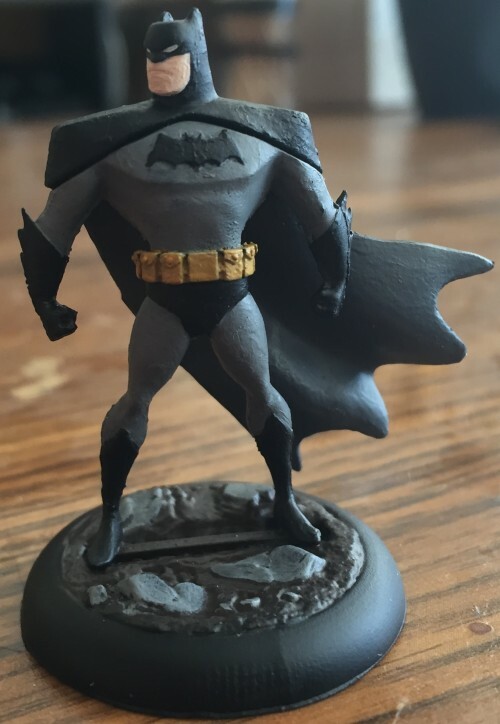 Unlike other figures for the Batman Miniature Game, the Animated Series line seems to be geared towards newer and/or younger gamers and painters. The point cost for using them in a game is less than other versions of the same figures and there are less parts to worry about fitting together just so. Now this might now have been Knight Models’ intent, but these new Animated Series figures are a fantastic way to get people to try the line. I just hope we get a Two-Face, Man Bat or Killer Croc out of it. 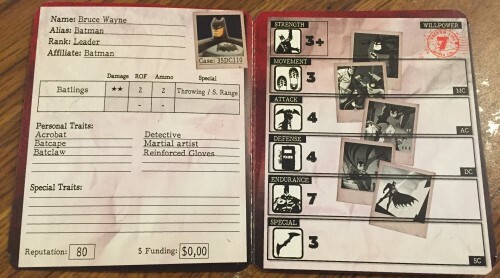 First up of course is the centerpiece of not just TAS, but the Batman Miniature Game as a whole – Batman. This review will be very photo based (twelve in all) and be a step by step look at the painting process while also giving commentary on the general figure. Spoiler alert – this is my favorite figure in the line so far. Now with that, let’s get started! So let’s look at our first picture. 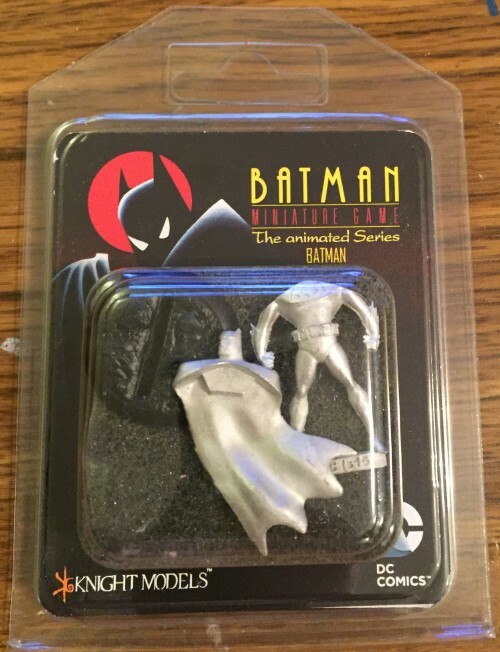 This is Batman in his B:TAS/BMG blister. 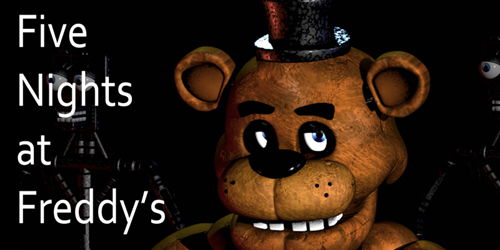 As you can see, he’s only two parts. Most Knight Model figures are at least five. However, the level of detail and pose lose nothing from the reduction in parts – which hopefully will be something we see going forward with KM figures. 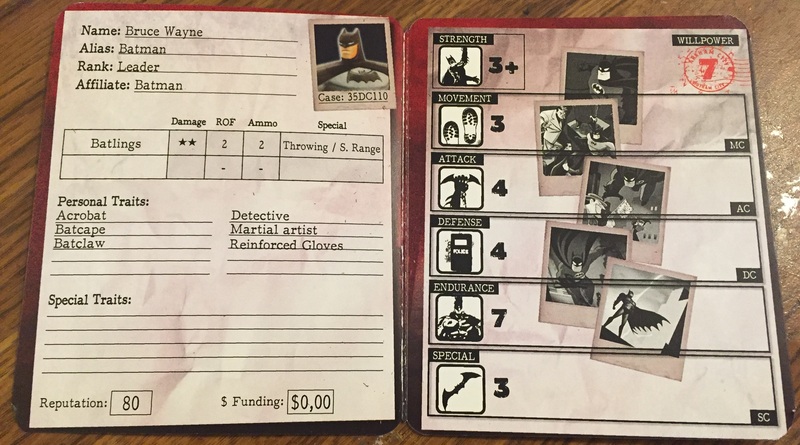 Here is a look at Batman’s character card for the Batman Miniature Game. 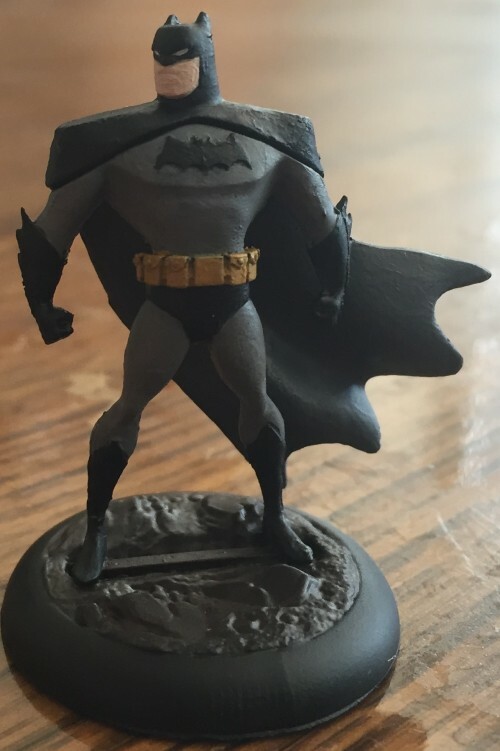 At only 80 points, he is is the second least expensive Batman released. Only Adam West is cheaper in points. He’s still a pretty terrific figure and that low point costs means you can field a larger team than normal. 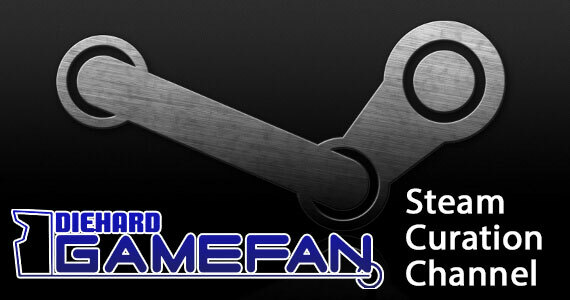 Generally a BMG game is between 300-350 points and some Batman, like the Arkham Knight version, costs 150. So this means your Batman led team is much smaller than other warbands. It’ll be fun to see what you can do with this guy in a game. 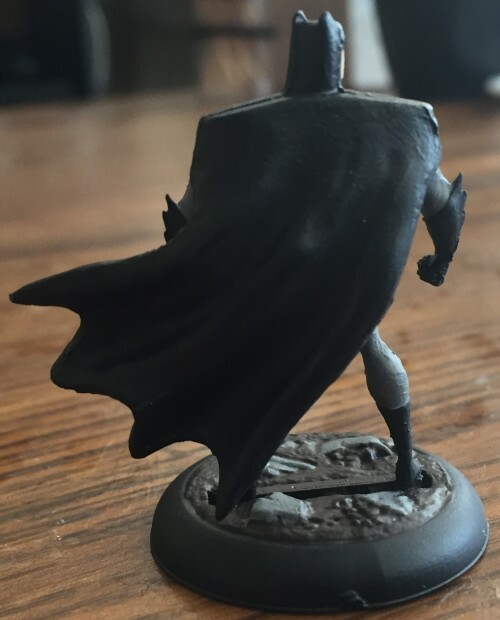 Our next picture shows Batman loose from the box. You can see both parts and his textured base here. Nothing fancy – just a close up of the pieces before we begin painting. 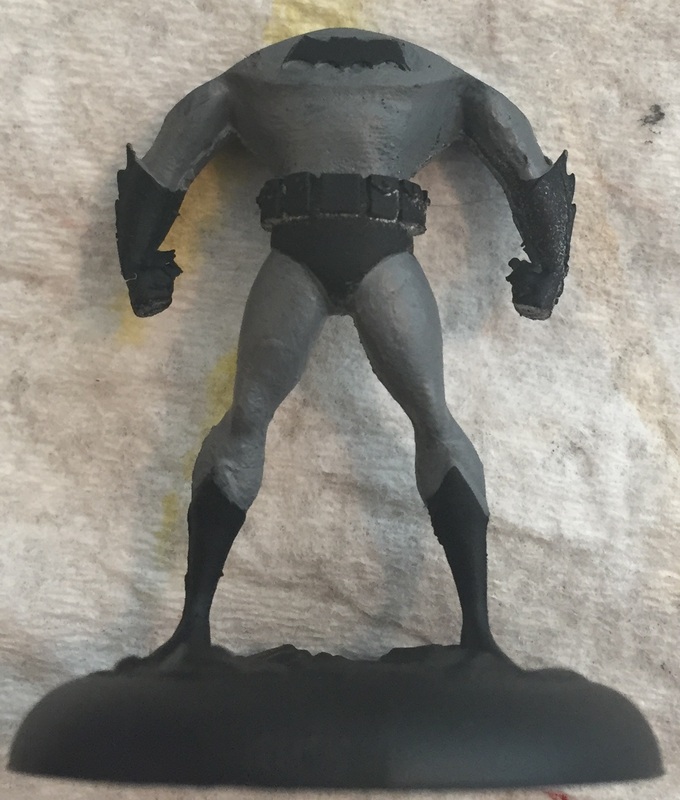 Here is Batman primed in black. Now I haven’t glued the two pieces together yet. I’m going to be painting them separately. Sometimes I paint then glue. Sometimes I glue than paint. It all depends on the piece. In this case, because the cape is separate from the back, I wanted to make sure I would be able to paint the entire back and belt properly. What’s nice though, is this photo shows you how easily the two pieces fit together. There’s no room for wriggling around, trying to find the exact angle pieces need to connect at while your super glue dries. Nope. The two pieces fit together perfectly, and I love it! Here we begin with the painting process. Now usually with miniatures you have your core coat, followed by various shades, highlights, shadowing and the like to really make the figure come alive. 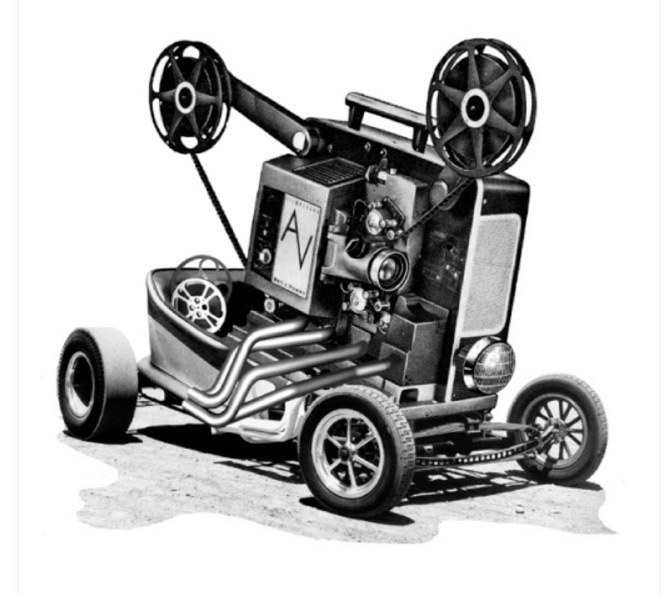 However cartoons, especially hand drawn ones, tend not to have any of that. It’s just basecoat colors for or less. 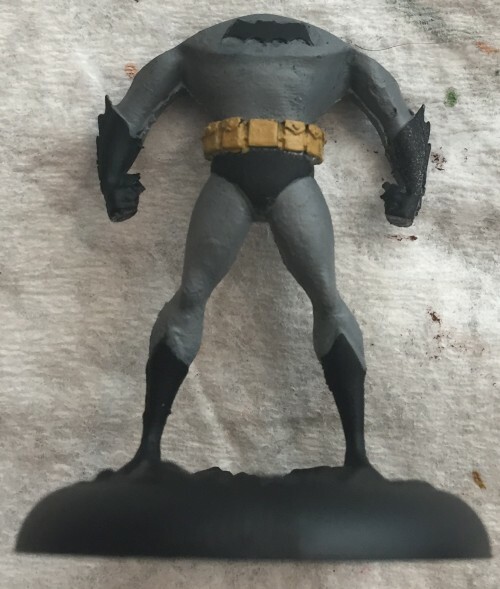 So although it is contrary to how I normally paint, I went vary minimalist with this guy to ensure he looked like a cartoon and more importantly, like Season 4/Gotham Knights/The New Batman and Robin Adventures Batman. He’s missing the oval around the bat symbol and the bat is much too big for seasons 1-3 of Batman: TAS. So I got out the season 4 DVDs and set them out while I started painting. I wanted to make sure I got this Batman just right. To start, that meant painting the major color on the figure, which is a medium to medium-light grey. 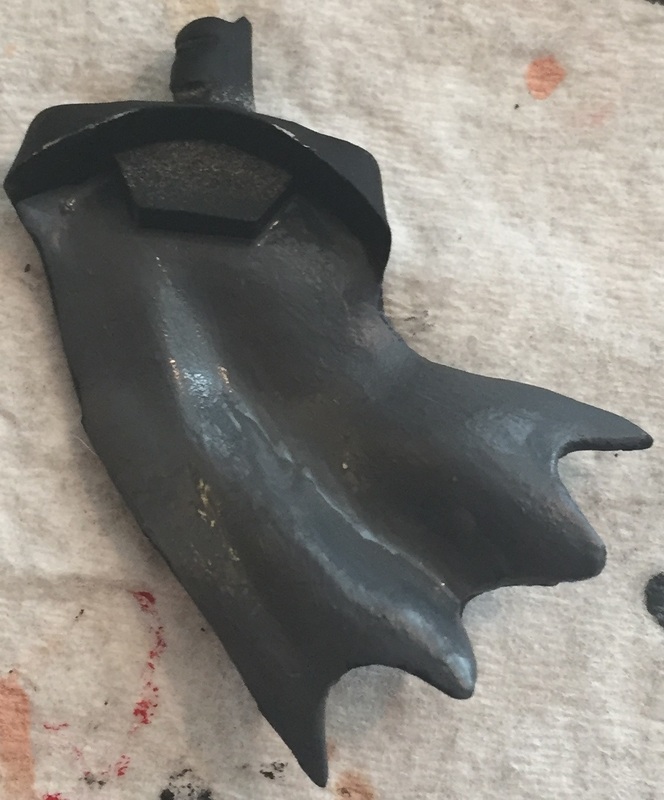 For this I used Citadel’s Dawnstone, which is my go-to “Batman Grey.” Here you can see the result. Now for the cape. In Season 4, the inside of Batman’s cape is a darker grey than the grey of his costume, while the outside of the cape is black. So I had to find a good grey for this. Russ Grey was too light and blue and Essin Grey was TOO dark. So I ended up choosing Citadel’s Mechanicus Standard Grey which was actually a perfect fit when I held it up to the DVD box and the screen I had Batman paused on. You can also see this is why I didn’t glue the figure together yet. If I had, there would have been parts of the inside cape I wouldn’t have been able to reach properly. Now let’s go back to the body as we wait for the cape to dry. It’s time to do the utility belt. For this I chose Citadel’s Zamesi Desert. Now much else to say here. 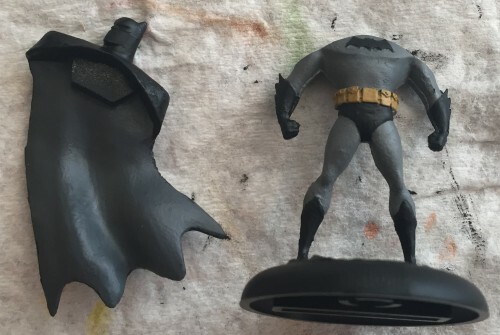 Now it’s time for the second most prominent color on Batman – the black. Now some people might have just chose to leave the primer black on and call it a day. I don’t. There are several reasons why. The first is, if I mess up with one of the other colors, I just can’t spray the figure over. Maybe if I used an air brush, but I don’t. As well, the Chaos Black primer is very thin and dull. It’s for putting paint on. I wants a glossier black to really make the figure pop, so I grabbed Citadel’s Abaddon Black and went with that. As you can see, this black looks so much nicer than the primer Chaos Black too. The whole piece is really started to come together and we haven’t even finished the basecoats! That’s how awesome this figure is! So now for the head. A dab of White Scar for the eyes is simple enough, but then we have the face. 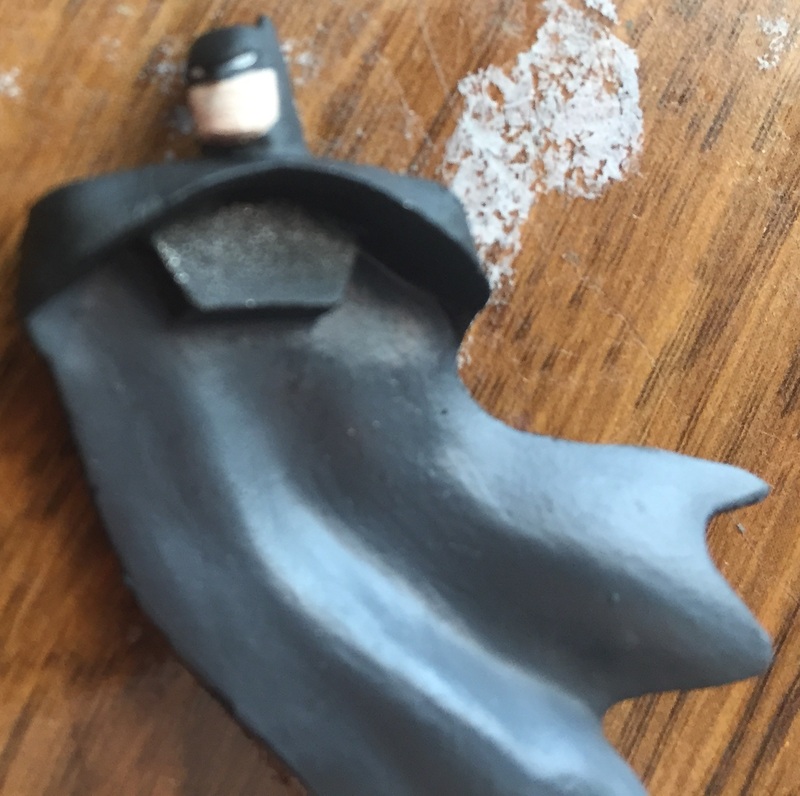 Since this is just the basecoat it’s just two layers of Reaper’s Fair Skin paint (it’s very thin) so that the jaw is clearly distinct from the cowl. Once the figure is assembled, we’ll go back and add some more here to make it come alive. Here we have the figure glued together. You’ll also notice the based is now brown (Rhinox Hide to be exact). I did a quick basecoat of that to act as dirt. You can see how good he looks even with some work left to do. At this point, someone could have called it a day, but I really wanted to add more depth to the skin and clean up some obvious areas that needed touching up. So here now is the finished Batman. For the skin I ended up using some Reaper’s Fair shadow and then gave the mouth a quick Flesh Wash (also by Reaper) to make the character look more like its animated counterpart. Everything else was just some light touching up. Again, since this is based on a cartoon, no shading, highlights, washes or shadowing were needed. Cartoons don’t have that, and to do anything more to him would make B:TAS’ Batman look less animated/cartoon-y. I’m extremely happy with the end result. The back of the painted figure. Again, this was a very minimalist approach to painting Batman, which is not how I usually do things. the Animated Series line however, kind of needs that if you want to stay true to the source inspiration and it came out shockingly well. Tomorrow we will look at the second TAS release in Catwoman. 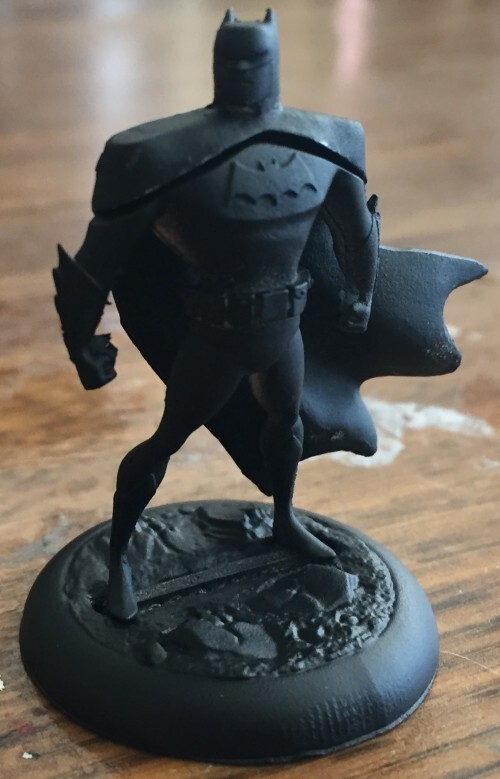 Remember, that this will be available in a few days at your local gaming store, so don’t hesitate to ask them to start carrying Batman Miniature Game pieces if they aren’t already. Thanks! I’m really happy with how he turned out.